A recollection from my father. Witnessing the meeting of two birds on Noongar land (north of Albany, Western Australia) a real 'privilege'. Like two jewels in the bush acknowledging the beauty of the other. 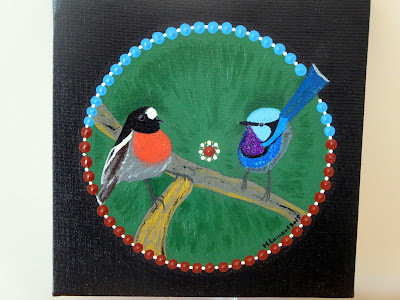 Both the Scarlet Robin and the Blue Wren feature in Dreamtime stories. For example check out 'Dreamtime' by Noongar Elder Theresa Walley.